Fried Morels: Easy and Delicious! 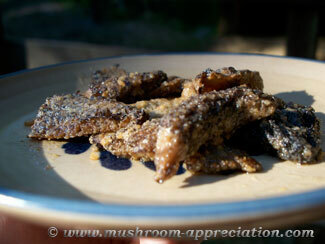 Fried morels are one of the simplest mushroom recipes going, and a great way to enjoy your springtime bounty. This recipe needs minimal ingredients and effort, but it does require a big appetite! Many people make this recipe with flour, but I've used Panko breadcrumbs here to mix it up and make 'em extra crunchy. Flour works too so use whatever you have on hand. Just make sure your breadcrumbs don't contain MSG, as some brands do. As with many mushroom recipes, the question exists of how to prepare them. To wash or not to wash? I advocate just wiping mushrooms down with a damp cloth, but morels are so pitted that it's easy for dirt and bugs to hide in them. Unless you like gritty mushrooms, you may want to give them a quick cleaning. Recommended: Rinse them under the faucet in cold running water, just long enough to remove the grit. Gently pat them dry. For Really Grimy Mushrooms: Let them soak in a bowl of cold water with some salt for 15 minutes, then rinse them off and pat dry. Don't use too much salt or it will affect their flavor! For Really Clean Mushrooms: Wipe them off with a damp cloth, trying to remove all the dirt without shredding them apart. (While great for other types of mushrooms, this isn't really recommended for morels). Do what you need to remove the dirt to your satisfaction. Usually a quick rinse or soak is enough. If you slice them first, cleaning will be easier. 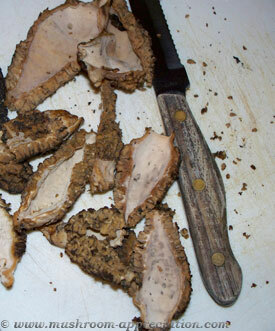 Check out this page on cooking morel mushrooms if you want more guidance on preparing morels. Note that amounts of morels aren't listed. Just prepare as many as you want to eat. Keep beating eggs and adding more butter to the skillet until the mushrooms are gone, which will be sooner than you want! In a large bowl, roll the morels in the beaten eggs. Make sure they're fully covered. Melt the butter in a large skillet on medium-high heat. Fry the morels until they are brown and crispy on all sides. It's best to do this in small batches, rather than overcrowding your skillet. Repeat until you're so full that you can't take it anymore, or until you run out of mushrooms. 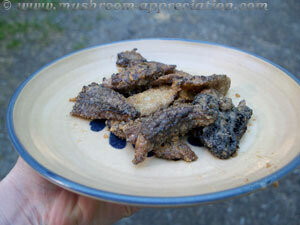 This is a simple fried morel mushroom recipe, but you can dress it up however you like! The one caveat is not to add anything that will overpower the flavor of the morels. If you don't do butter, do know that you can fry them in any oil with a high smoke point. Butter tastes best, but other oils work for frying too. 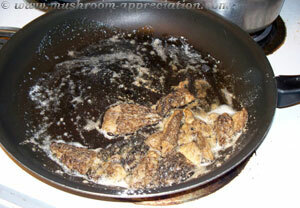 Add a clove or minced garlic or two to the morels when cooking. Slice 1-2 onions (or shallots) and brown them in a separate pan. Don't cook them together as the onions cook at a different rate, but a few browned onions added to fried morels are delicious! Add a teaspoon of your favorite herb to the dipping mixture. This is a delicate dance, as you don't want to overpower your morel flavor. Experiment with a small amount to start. Truly this recipe is best prepared as simple as possible to showcase the flavor of the mushrooms. However, they're great as a side dish for meat, fish, or salad as well.